Weiner Tales: 3 on Thursday - Summer "Musts"
What are your 3 summer-time must do things (trips, family traditions, etc.)? 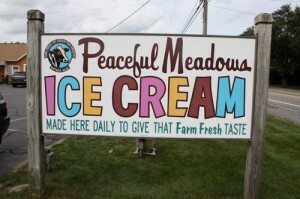 First, it isn't summer without a trip to Peaceful Meadows. Seriously the best ice cream on the planet! I really think getting to see the cows that the milk comes from make the experience that more special. Just um...do yourself a favor and if you're going into the cow barn to visit the cows...go early enough that the barn doesn't stink yet. Whale watching. I'm blessed enough to live very close to water - and have a natural affinity for it. I just love boats, the beach, lakes, etc. The whale watching off of Plymouth is some of the best in the country in my opinion. There never seems to be shortage of majestic whales just waiting for the tour boats! What about you? What's on your summer list? I love your list! And you are VERY blessed to live near the water!! can't wait to hear about the pups!! Yay! I guess you could not get fresher milk for the ice cream than that! Totally jealous of the whale watching! How cool!